How To Get There: Head east on Main St. in Buena Vista, turn left on Colorado Ave (County Road 371). Follow the road across the river to County Road 377 - about 2 miles. Once you turn on CR 377 (just before the tunnels) you go 5 miles and turn right on CR 375. Follow CR 375 1.1 mile and the remains of the old wagon road will appear on your left. Motorized traffic is restricted up the old road, and only hiking is permitted up to the mine, about 1/4 mile. The climb is steep, but clear. Difficulty: Paved roads all the way to CR 377. CR 377 and CR 375 are easy four-wheel dirt roads. The old wagon road up to the mine is a steep hike and although not marked, it should not be accessed by 4 wheel drive. 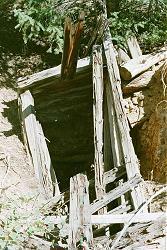 Evidence of small mining operations exist all over this area. History of Little Annie Mine: It was April 20, 1894 when J.K.Casteel, Annie Casteel and Charles Thompson knew they had discovered a valuable ore deposit and filed their claim in the Four Mile/Swift Water Mining District. They named their claim the Little Annie. Field notes from Mineral Survey No. 17100 show a 90 foot deep shaft was sunk, and a maze of tunnels branching out in all directions was bringing valuable ore to the surface. At one time the Little Annie had a "Shaft and Power House and Boarding and Bunk House for the miners", although none remain today. Was claim jumping involved here? Additional records show a Buena Vista attorney filed supplemental claims on either side of the original Little Annie claim several years later and the names English, Knox and Cameron appear. This mystery is solved in Volume II of our video collection.